How did James Bond win at Casino Royale? Why do I always lose at Monopoly? Is it any use to join the imperial army in Skyrim? These are the topics of game theory. Or so you might think, because that’s just plainly wrong. „Game theory“ is a rather young and hot set of mathematical models to describe conflict or cooperation between men, mice, fish or any „decision maker“. Now to something completely different: To Erwin Schrödinger, the physicist famous for his cat. He told us: The electron is not a very, very tiny billiard ball rotating around a bowling ball called nucleus, just like the moon rotates around the earth. Because even if we don’t see it, we have a very precise understanding where the moon is at any given moment. In quantum physics we are uncertain. Especially when it regards the whereabouts of electrons. It could be here or it could be there. But Schrödinger gave us an equation that allowed calculating the probabilities of its location. Doesn’t sound very convincing, but it tends to give very usable results in fact. And why should we complain about something that actually works? Sorry for telling two different stories, but the news is: They are related! There is a branch called „mean field game theory“. If you have huge populations consisting of many individuals, how do you explain the group behaviour through all the tiny decisions the individuals make? It is similar to mean field theory in physics, where you calculate the „behaviour“ of large numbers of particles though individual particles that have almost no impact upon the system itself. In the next step, let us compare electrons with herrings. To do so, let’s assume we all were fishermen trying to catch as many fish as possible, when a school of herrings approaches our boat. 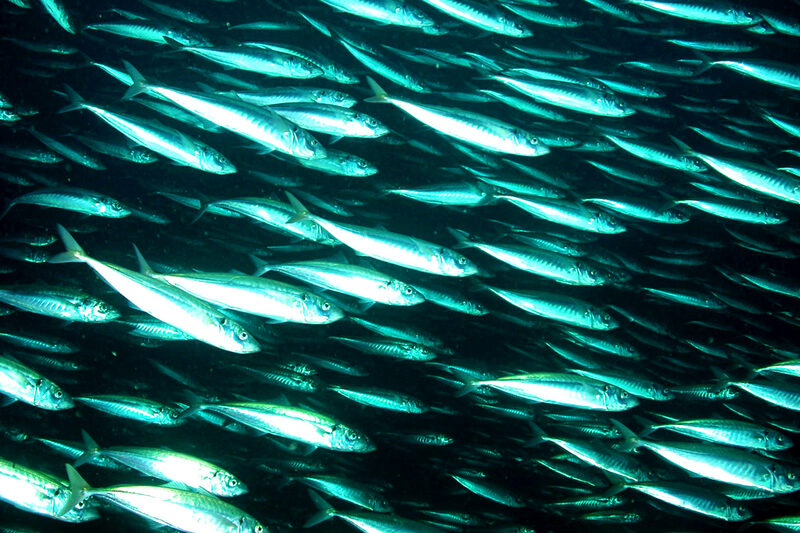 Just like electrons the individual herring’s location seems hard to calculate. At least they tend to stay in the security of their big school and they seem to react to some unwritten rules. But in reality, if you examine a single herring it may just now strife for some very tasteful plankton while others are busy discussing their sexual life and some inexperienced ones may even follow a red herring to a very wrong place in their life’s story. If you, the fisherman or fisherwoman, want to calculate the herring density in any given spot in the water your results will be very poor if no herrings are in sight. But if the school of herrings gets nearer to your baits your mathematical model will show more and more hits. And then the fish pass your position! Bing, bing, bing! The question you may ask yourself: What kind of mathematical model could fishermen (or fisherwomen) use? Is there something that already fits or must “mean field game theory” write a whole new book of rules? Scientists led by Igor Swiecicki from „France’s Laboratoire de Physique Théorique“ in Orsay really used fish – or a school of fish – to demonstrate that there already is a ready-to-go rule to work with. They proved that you could use Schrödinger’s equation to describe the behaviour in a school of herrings. To be more exact: The probability of finding a fish in our example changes exactly like the probability of finding an electron. Now that’s a bit weird, right? But let’s be honest: That’s exactly how working as a quantum physicist feels most of the time. And we are quite used to stretching, squeezing and distorting the Schrödinger equation for quite a while now to fit within a wide array of problems. If Schrödinger’s equation can really be applied to game theory, that should give the young mathematicians a head start. Maybe one day, not too far from today, we will finally be able to calculate why there is always a traffic jam when I’m in a hurry.